The extensive growth of pivotal end-use sectors such as photo-luminescent paints & coatings would irrefutably drive phosphorescent pigments market along a lucrative growth path over the ensuing years. Despite not being a niche vertical of bulk and specialty chemicals industry, phosphorescent pigments market has been gradually marking its presence across diverse business domains since past few years. Apart from paint and coatings sector, the demand for phosphorescent pigments has been witnessing a steady increase in a host of other notable sectors including home appliances, writing and printing inks, textile and fabrics printing, signboards, outdoor path marking, electronic instruments, dial pads, and military applications among others. Needless to mention, the wide expanse of end-use applications would be the most prominent factor to augment the growth prospects of phosphorescent pigments industry, which is forecast to register a decent CAGR of around 4.5 percent over the estimated timeframe. The product landscape of phosphorescent pigments market has been divided into two major streams, namely zinc sulfide and strontium aluminate. These substances are increasingly referred to as ‘glow-in-the-dark’ pigments which are usually manufactured using fine crystals of zinc sulfide or strontium aluminate. While elaborating upon the product application of phosphorescent pigments industry, it would be quite prudent to take note of the fact that zinc sulfide based pigments, whose crystals are generally activated with silver or copper, were the most preferred phosphorescent pigments to be utilized by various business sectors until recently. Apparently, strontium aluminate based pigments, which are activated with a rare earth metal, have been extensively replacing zinc sulfide based pigments over the past few years courtesy- their competitive pricing and superior properties which enable these pigments to emit luminance which, as per industry experts, is 10 times greater than zinc sulfide based pigments. Therefore, it is quite self-evident that the overall phosphorescent pigments industry would be driven by strontium aluminate segment, which has been vigorously capturing the attention of various end-user industries owing to its aforementioned characteristics and is slated to expand at an annual growth rate higher than that of zinc sulfide in the upcoming seven years. The growing popularity of phosphorescent pigments can prominently be attributed to a massive spurt in the demand for glow paints with photo-luminescent properties, which is further likely to impel the market share of the global phosphorescent pigments industry. Phosphorescent pigments are added to these glow paints and coatings where the crystals absorb the light in an illuminated environment and emit the absorbed light in the darkness. Apparently, these phosphorescent pigments are increasingly being incorporated by renowned automobile giants in manufacturing exceptional vehicles, equipped with customized glow-in-dark paint, a trend that is bound to propel phosphorescent pigments market in the immediate future. To cite an instance, the Japanese automotive behemoth, Nissan hogged immense limelight in the year 2015, by establishing itself as the first car manufacturer in the world to offer an electric vehicle, christened as Leaf, painted with a special concoction of strontium aluminate and organic materials. As per reliable sources, this unique paint absorbs ultraviolet light during the day, which provides it with sufficient power to glow for 10 hours in the night. Furthermore, this paint can reportedly last for up to 25 odd years, something which reinforces the sustainability quotient and is likely to inspire the automotive sector to willingly embrace solar energy in its ongoing quest to lower their share of carbon footprint across the globe. Apparently, it goes without saying that such innovative applications of phosphorescent pigments by paints and coatings industry, which dominated the end-user domain with an estimated market share of over USD 65 million in 2016, would immensely benefit the global phosphorescent pigments industry space over the ensuing years. While speaking of the prospective remuneration portfolio of phosphorescent pigments market, in regional terms, it is noteworthy to state that the Asia Pacific region held an impressive 50 percent portion of the entire phosphorescent pigments industry share and, in all likelihood, would sustain its top spot by 2024. The decent pace of growth being witnessed in paints and coatings market coupled with a burgeoning construction sector would propel the demand for these pigments, consequentially expanding the Asia Pacific phosphorescent pigments industry size over the time span of 2017-2024. 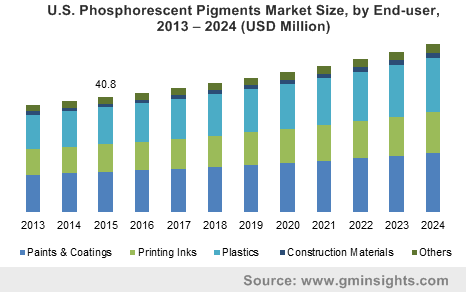 Going by the latest research report of Global Market Insights, Inc, the overall phosphorescent pigments market share is forecast to exceed USD 290 million by 2024.